A breathtaking true story of a rescue mission undertaken by a young woman and her family in one of the most repressive countries in the world. Pushing through rivers and forests, fighting the cold, bribing and manipulating border guards, gangsters, and secret service agents, Helie and her father finally achieve their goal. But there are many hurdles. Her uncle is forced to make a harrowing choice: leave his North Korean family behind or continue to live in oppression and starvation away from his beloved mother. 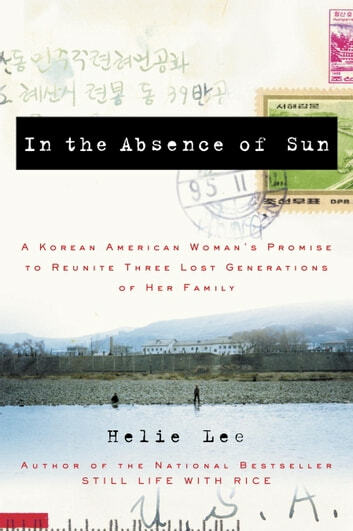 And Helie has to face her deep, sometimes ambivalent, emotions about her identity in the family and as a Korean American woman. Unmarried and outspoken, she struggles in Korea, where women marry early and keep silent, and writes eloquently about the landscape there, both literal and cultural. She comes through a heartbreaking love affair only to face an intense and confusing relationship with the Guide—the man who, despite being crude and macho, ultimately helps to save her uncle and eventually his extended family through several daring acts of heroism. In the Absence of Sun is a riveting adventure story and a powerful tale of family bonds and reunion.